Happy Tuesday! I hope you enjoyed the long weekend in honor of our veterans. It was a fairly quiet one for us, although we did have the pleasure of attending a beautiful wedding on Saturday. It's been incredibly windy and dry which undoubtedly is making the California wildfires worse. It's absolutely heartbreaking. My dad and grandmother live near Thousand Oaks, but thankfully they are alright and their homes are not threatened. It's always difficult for me to blog about clothes when there are so many serious issues facing people, so I'll keep things brief. 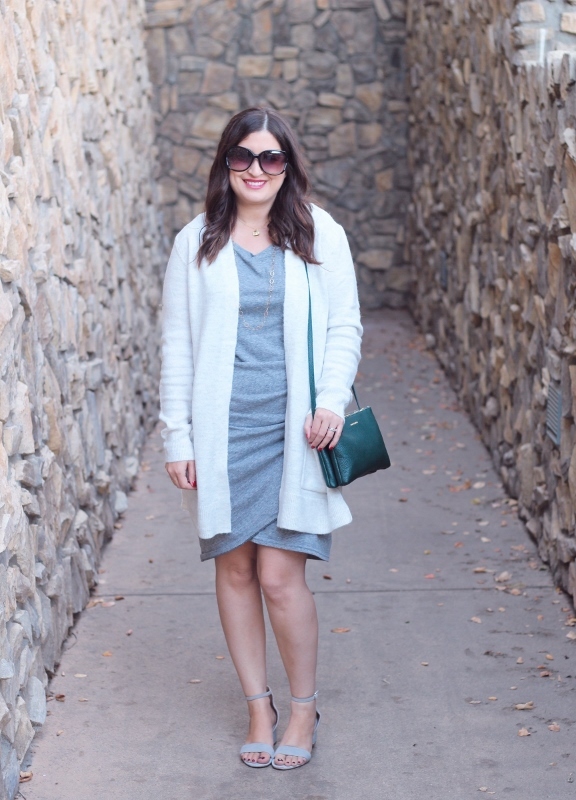 I'm still all about the basics, and both my cardigan and dress are must-haves. They are the perfect soft, cozy knits that I'll live in for the rest of the year and well into Winter. Beauty // Lipstick in MAC Powder Kiss "Burning Love"
You'll probably recognize this Leith dress, as I've worn it on the blog before. It has a good amount of stretch, looks flattering against my curves, is fantastic for layering, and comes in several colors. I'm contemplating getting another one in black...it's hard to resist! As a rule, I try not to buy items in multiple colors anymore but I've got to admit that this dress is very tempting because of how versatile it is! Go up one size in case you are interested. I'm a pretty standard medium across the board, but I had to get a large in this and the fit is perfect. 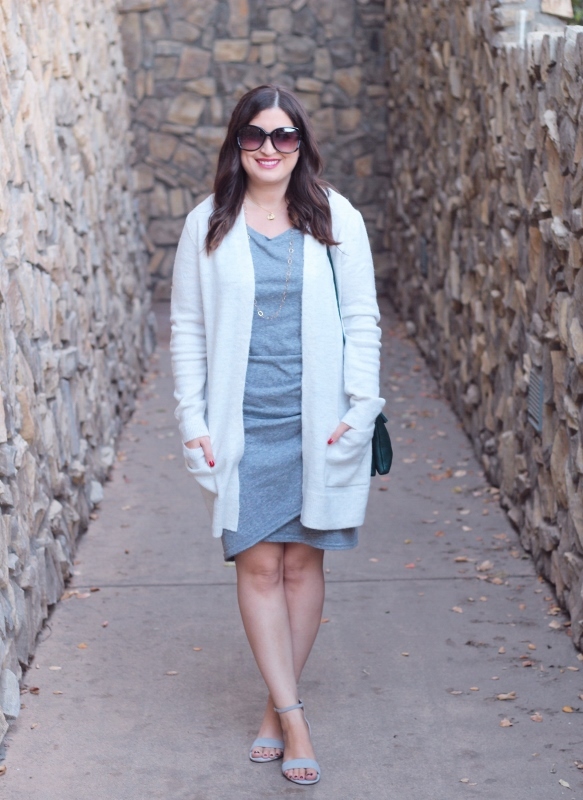 The Old Navy cardigan is a recent buy from one of their never-ending sales. I don't know how people keep up with them! It's also very soft and layers well over dresses. All I need is a pair of ankle boots and I've got my Thanksgiving outfit covered. 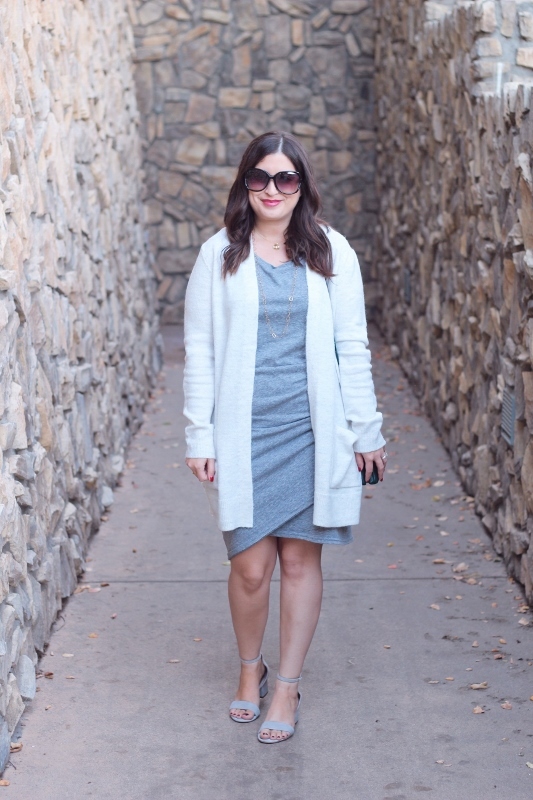 This dress is a classic and this knit looks so comfy. Happy to hear your family is safe, this is so heartbreaking. Those fires are brutal. I'm glad you and your family are safe from them, but it's hard to imagine all the families who've had their homes devastated. I love that dress - I've got a similar style I haven't worn since last year, for shame! First of all, you are gorgeous and your outfit put a smile on my face. You can never do wrong in my eyes :) I'm glad you and your family are safe. I struggle with talking about "fluffy" things too. There are a lot of bad things happening in our world: there is a child dying of malnutrition in Yemen every 10 mins, gun violence in the US is higher than it's ever been, as a specie we continue to damage our planet,...the list goes on. I keep reminding myself that as long as I can do my part to educate and volunteer some of my time, a little fluff goes a long way to help my mental health. I have that dress is green and agree on its versatility! The first thing I noticed about this post though is your hair! It looks extra fabulous in these photos!